Submitter & Translated by Rose Vetter, published 13 May 2008 at DVHH.org by Jody McKim Pharr. Permission for publication on the DVHH website was granted by Hans Supritz of Ulm Germany, one of the publishers of these books and a member of the Palanka HOG. After completing his academic studies in 1883, he made his first trip to the Orient. In the same year he made his artistic debut in Budapest with the Islamic theme, "Healing through the Koran." Almost every year he traveled to the Kaukasus, Turkey, Egypt, Syria or Tunisia; he was fascinated by the people and culture of these regions. 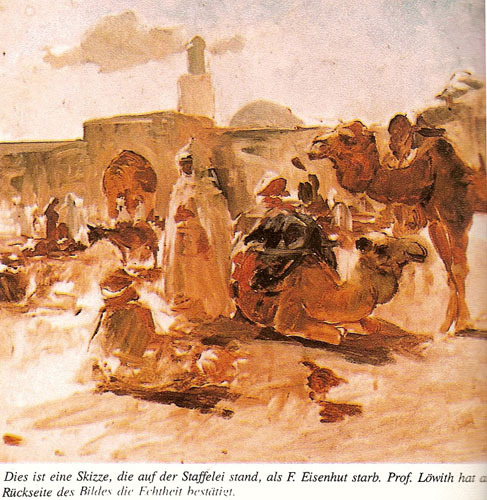 His sojourns would last from seven to eight months per year, while he drew sketches which he used for his paintings in Munich, his adopted home. At the age of 33 years he was already a world-famous artist whose paintings were admired in European and overseas exhibitions, providing him with a carefree life, prominent world status and popularity with the public. He was also lavished with commissions from art patrons and dealers. Among his best-known works are the paintings "Death of Gül Baba", "Money Changers in Tiflis", "The Storyteller" and "The Pasha's Concubine". His most monumental work of art, "The Battle at Zenta", measuring four by seven meters, was commissioned by the Batsch Bodrog Comitat in Sombor for the millennium of Hungary. It is still exhibited in the former Comitat Building today. 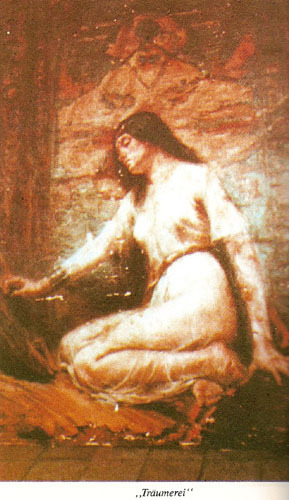 Eisenhut received numerous prestigious awards for his paintings and was the first artist to receive the national gold medal in Budapest for "Death of Gül Baba". He belonged to a group of artists who focused their work on the Islamic world. In 1897 Eisenhut married Adriane Reichel of Palanka. In the following year, the young couple with their infant child wasted no time in accepting the invitation of the Emir of Bukhara. One result of this trip was the painting "National Holiday in the Kaukasus". It is said that the wife and child of the artist are depicted on a horse in the left section of this painting. The child died during their stay in Samarkand. Eisenhut's works attracted the attention of Prince Regent Luitpold of Bavaria and eventually earned him the affection and friendship of the ruler. Emperor Franz Josef also was impressed by his talent and purchased the painting "Death of Gül Baba" for the throne room of the royal palace in Budapest. His home community of Palanka honored the artist by naming one of their most beautiful streets after him. Whenever he paid a visit to the town of his birth, he was welcomed and celebrated with the highest honors. When he became critically ill in Munich at the age of 46 years, Prince Regent Luitpold of Bavaria came twice to visit him at his deathbed. 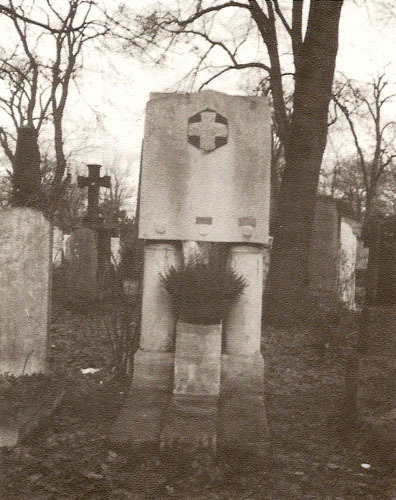 Franz Eisenhut died on June 2nd, 1903 and was buried in the Central Cemetery in Munich. The Artists' Association of Munich erected a monument in honor of their famous member. In his book, "Erzählungen aus dem vorigen Jahrhundert" - "Tales from the Last Century," Nikolaus Hepp, the chronicler of Palanka, has vividly characterized the work of Franz Eisenhut. 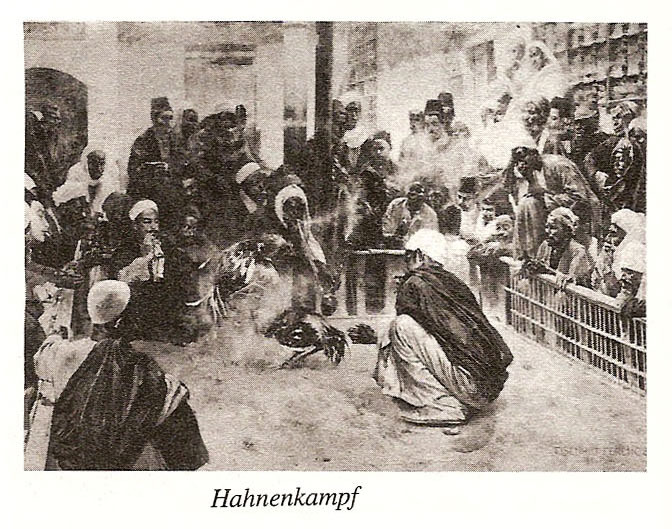 Hepp points out that Eisenhut belonged to an era during which there was a partiality for gathering subject matter from the Orient. The trend of that period was to portray this gaudy, flamboyant world in the style of Rembrandt. His paintings achieve their unique charm through the strength and mood of color. In the early stages of his career, Eisenhut loved to position strong contrasts of bright and dark opposite each other; but later on he tried to mitigate this harshness in order to achieve a softer over-all effect. He preferred to paint everything which emitted strong color, race, movement and passion. Repeatedly he portrayed the life and times of people in Turkey, Asia Minor, Egypt and North Africa. Thus, through his illustrations he endeavored to achieve an individual and characteristic expression, making his striking paintings rich in ethnographic and culture-historic traits. Professor Löwith confirmed its authenticity. This is a translation of excerpts of two articles on Franz (Ferencz) Eisenhut of Palanka, Batschka, taken from volumes I and II of “Palanka and der Donau” Permission for publication on the DVHH website was granted by Hans Supritz of Ulm Germany, one of the publishers of these books and a member of the Palanka HOG. A special thank you to Hans Supritz, for his dedication and hard work for the Palankaers and Donauschwaben.